Last Thursday was doyo no ushi no hi, or the midsummer day of the ox. It’s said in Japan that eating eel can revive you when you’re suffering from tiredness due to the heat of midsummer. So on doyo no ushi no hi it is traditional to eat eel in Japan. Unfortunately, this summer domestic eel prices have been soaring, and as a result, one unscrupulous importer was caught importing Chinese eels and trying to pass them off as Japanese ones. After last year’s contaminated gyoza scandal, many Japanese people are wary of Chinese imports and would prefer to buy domestic eels instead. As a result, prices are climbing ever higher. This year, unusually, there are two doyo no ushi no hi, with the second one falling on August 5th, so if you didn’t have your eel last week, there’s still a chance to have them next week. While it may have been difficult to get eels last Thurday (I don’t know for sure because I already had plans for dinner), I had no problem finding unagi kabayaki, or grilled, sweet sauce-basted eels, at my market on Monday. They were still on special from the previous week, so I bought two to compare-one from Kagoshima Prefecture and another from Aichi Prefecture. Two unagi was enough for dinner that night and Alex’s lunch the next day too. When I got home, first I chopped up some vegetables and put them into my new shokutaku tsukemono no ki (tabletop pickling pot) and salt rubbed some more to make nuka-zuke. I’ll post some more about my pickling adventures later. After I had gotten my vegetables started pickling, I made a batch of chawan mushi. I had bought a steamer from Amazon.co.jp that works great as a rack for steaming and for canning. I followed the same basic recipe for chawan mushi that I used before. For filling I went with a combination of shelled edamame, carrots (cut into plum-blossoms), mitsuba, shiitake, and fresh corn. I think the fresh corn didn’t make a great filling for the chawan mushi, so I’ll stick with the traditional slice of kamaboko instead next time. The chawan mushi custard came out really smooth and the flavor was just right. Using a steamer was a huge improvement over a water-bath in the oven. Next, I grilled a few more ears of corn in my fish broiler before finally grilling the eel (also in the fish broiler). I flipped the eel a few times to be sure that both sides were heated and nicely crisped before I chopped them in half and put them in a donburi with rice. I finished the dish with the sauce that came with the eel, crushed sansho, and a spring of kinome from my balcony garden. The citrusy spice of the sansho and kinome contrast nicely with the sweetness of the unagi’s sauce and so they are a traditional accompaniment with unagi kabayaki. If your eel doesn’t come with it’s own sauce use a simple homemade teriyaki instead (2 parts soy, 1 to 2 parts sugar, and 1 part mirin or sake, boiled until slightly thickened). So our finished dinner was unagi donburi (grilled eel on a bowl of rice), salt-pickled cabbage and cucumber nuka-zuke, vegetable chawan mushi, and grilled corn. I would say it’s one of the best “homemade” dinners that I’ve made since we’ve been here in Japan. I say “homemade” since the eel was pre-cooked so all I had to do was reheat it and crisp it up in the broiler. As for the verdict on our two different eels… I liked the tender texture of the Aichi Prefecture unagi, while Alex preferred the firmer Kagoshima Prefecture unagi. I guess there are different strokes for different folks. Broil the unagi fillet until it is heated through and both sides are as browned and crispy as you like. Cut the unagi to fit in your bowl (or cut in half if you’re sharing). Fill your bowl with steamed rice, sprinkle crushed toasted sesame seeds on the rice if you like. Place the unagi fillet, skin side down, on top of the rice. Drizzle the unagi with teriyaki sauce and sprinkle with a generous amount of sansho kosho. Finally top with a sprig of kinome. Divide the filling ingredients between your five teacups. Beat the eggs in a large bowl. If the dashi is hot, add a little bit to the eggs and beat to temper the eggs. Then add the rest of the dashi, mirin, and usukuchi shoyu and beat well. Finally, strain the egg mixture and pour into the cups so that they are filled evenly. Place the cups in a steamer and cover. If you line the inside of your steamer’s lid with a cloth or towel, it will prevent condensation from dripping onto your custards. Steam for 8 to 10 minutes. The custards are finished when clear juice is visible when they are cut with a sharp knife. If you don’t have a steamer, you can place them in a water bath and bake for 25 minutes at 160 degrees Celsius. Cover with aluminum foil to prevent the tops from browning. Since the new school year began in April, I have been joining my school’s cooking club after school on Wednesday afternoons. Their favorite dishes to cook are sweets and spaghetti. In preparation for School Festival they were baking cookies almost every week. I am looking forward to trying some new recipes with the club soon. However, summer vacation starts next week, so cooking club will probably be on break until late August. One cookie recipe that we tried that I really liked was “Matcha Balls.” The cookies remind me of Mexican wedding cookies, but less sweet, and with matcha and almonds instead of cinnamon and pecans. They have a lovely pale green color, which contrasts nicely with a dusting of powdered sugar. The recipe is really small so that you can fit the whole batch in a tiny Japanese oven, which is just slightly larger than a toaster oven, but with two shelves instead of just one. Following the original recipe, the cookies weren’t very sweet, so I increased the amount of sugar from 20 grams to 30 grams (that’s just shy of a quarter cup). If you have an American-sized oven, you could probably comfortably double or even triple this recipe. One note, make sure to bake the cookies for the full 20 minutes. Although they shouldn’t brown at all, they should be dry all the way through. If they are undercooked the texture will be a bit pasty in the center. The recipe calls for hakurikiko, or weak flour that is available in Japan. This is probably similar to cake flour in the US. The cooking club actually uses all-purpose flour and the cookies are fine that way too. The cooking club also tried a version that omits the almond dice, and those are delicious as well. Line a baking sheet with parchment paper. Preheat oven to 160° C (320° F). In a bowl, mix butter and sugar with a whisk. Use a small strainer to sift the matcha into the mixture. Mix until the matcha is evenly distributed. Stir in the almond dice. Then stir in the flour. Use a rubber spatula to gather the dough together. Roll the dough into 2 centimeter balls. Place the balls on the baking sheet about 1 to 2 centimeters apart. Bake for 20 minutes. Remove cookies from the oven and cool. When cooled, sprinkle with powdered sugar. One of my school’s English teachers’ hobby is growing fruit. He has about 30 varieties of citrus trees and several other kinds of fruit too. He also grows a vegetable garden. About 2 weeks ago, he brought in these strange-looking fruits – yamamomo. They’re about 2 centimeters across and quite bumpy, with a fairly large pit in the center. The flavor is sweet and sour, with a distinct floral note. I recognized them as the same fruits that I had tried at the Obanzai restaurant in Kyoto during spring break. The one I had in Kyoto had been preserved in syrup or liquer, so it was quite sweet, but with the fresh ones, the sour taste definitely dominated over the sweet. I am not sure if they are available outside of Japan; I certainly had never seen one before I arrived here. As with most (all?) Japanese homegrown fruits, yamamomo are quite seasonal, I suppose the season is probably already over. Fresh corn has been in the market lately. Although it costs more than at home (about 100 yen an ear), I’ve been really impressed with the quality and sweetness. One of my favorite ways of cooking them is simply shucking them and snapping them in half, then grilling them in my fish broiler. They brown a little but they cook quickly enough that they are still really sweet and crisp, and I really love the flavor they get from being grilled. I was in the mood for a quick dinner last week, so I made this easy fresh corn and zucchini soup. I had planned to add some milk to make it creamy, but the pureed corn gave it a very creamy texture, so I decided not to add any milk after all. Since I was in a hurry, I didn’t think to add any herbs to the soup until after it was finished, but I think that it would have been very good with some fresh sage, thyme, or garlic, too. I had a green zucchini, so that’s what I used, but it would probably have had a great sunny yellow color if I had used a yellow zucchini instead. I garnished the soup with fresh mitsuba, chives, corn kernels, zucchini, and enoki mushrooms. If you can’t find mitsuba, feel free to use Italian parsley instead. I’ve been writing recently about some uses for ume. 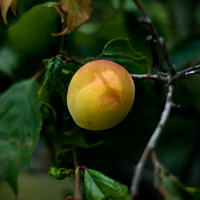 I’ve been taking some pictures of ume fruits on the trees around town lately too. 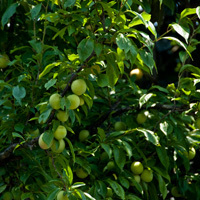 Most ume are harvested green, but they will turn yellow as they ripen. So what is ume anyways? 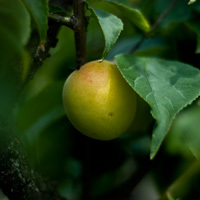 It’s often called Japanese plum, but actually it is closer to an apricot. The skins are a bit fuzzy and they turn yellow blushed with red when they are ripe. They are not eaten fresh, but are preserved in various ways such as in jam, syrup, or alcohol. The most common preservation method is probably umeboshi, the salty pickled ume that are often served with your breakfast or lunchtime rice. Different preservation methods are used depending on the stage of ripeness, and the ume can be used from when they are just marble-sized and still green (for umeboshi) to full sized and in varying shades from green, to yellow-green with a slight blush to yellow. There’s a handy chart (in Japanese) here that shows what methods are best to use for each color. 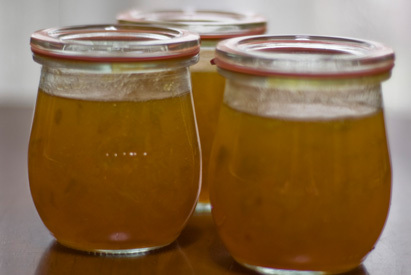 When I made ume jam a few weeks ago, I had a few ideas about how to do it better, so when a crate of ume appeared in the teachers’ room last week, you can bet that I was stocking up. I heard that one of the teachers at my school lives on an ume farm, so he brings ume to school every year around this time. I took 2 kilos of ume so that I could make another batch of jam and also try my hand at making ume-shu. These ume were still green but were definitely on the verge of turning yellow. I separated them by color, using the greener ones for ume-shu and the more yellow ones for the jam. The ume-shu was as easy as pie. It’s resting now, but I’ll try to remember to post about it when it’s ready to taste. This time, for the ume jam I drained the water just as it started to boil. Then I used the back of my knife to press the flesh off of the pit. I put the chopped fruit back into the pan. Finally, I put the still-pulpy pits into a strainer and used a rubber spatula to press and stir the pits around to remove as much of the remaining fruit as possible. Finally, I added about half-a-cup to a cup of water to get a slightly thinner jam and 800 grams of sugar. This time I used canning jars for the jam. By the way, I love these Weck canning jars that I bought for this project, they’re so cute! I didn’t have enough jars, so I put 2 cups of jam in “tupperware” and put them in the freezer. I defrosted one on Friday, and it seemed a little looser than the jam in the jars, so maybe I will re-cook the other one after I defrost it to see if it comes back together. I really wanted to try making an ume-shiso jam too, so for the last cup of jam in the pot, I stirred in about a teaspoon each of finely chopped yukari and the liquid from the yukari. Yukari is the red-shiso that’s used in making umeboshi, so it’s available this time of year. I bought some at Shoku-no-eki recently and it lives in my freezer, ready to be thrown into whatever dishes I want to add some yummy pickled-shiso flavor to. After tasting the ume-shiso jam, I decided that this way was definitely my favorite, so next year I’ll split the batch 50/50 between plain and shiso flavor. The shiso is salty and it gives the jam a more complex and interesting flavor than the plain ume provides. It’s not much of a difference in my yogurt, but I love it on toast! The yukari and yukari liquid also gave the jam a beautiful ruby tint. Wash the ume well. Use a wooden skewer or toothpick to remove any stem remnants. Soak the ume for several hours or overnight in salted water. Drain the ume. Place the ume in a large, heavy pot (an enameled cast-iron dutch oven works well) and cover with fresh cold water. Place over medium heat. When the water just begins to boil, remove from heat and drain ume. Use the flat side of a chef’s knife to press the flesh off of the ume. The pit will still have some fruit clinging to it. Set the pits aside. When you have pitted all the ume, chop the fruit roughly. Put the ume pulp back in the pot. Add 800 grams of white sugar and 1/2 cup to 1 cup of water to thin the mixture slightly. If you are making plain ume jam, add a generous pinch of salt (omit this if you are making ume-shiso jam, as the yukari is quite salty). Place over low heat. While the fruit mixture is heating, use a rubber spatula to press the pits against the sides of a metal strainer to remove as much of the remaining fruit as possible. Add this to the fruit mixture. Allow the mixture to simmer for about 15 minutes, until it has thickened slightly and coats the back of a wooden spoon. 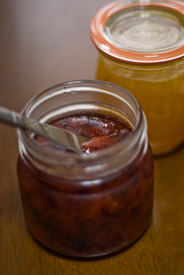 For ume-shiso jam, add one teaspoon each of finely chopped yukari and yukari liquid (or ume vinegar) for each cup of jam. * Stir and allow to simmer for a few minutes more to allow the color to incorporate into the jam. *1 kilogram of ume made about 5 or 6 cups of jam for me.